It’s called “vermicomposting” and yes, it involves worms—red wrigglers actually! It’s similar to backyard composting, except that it uses worms in addition to microbes and bacteria to turn organic waste into a nutrient-rich fertilizer. Worm castings and worm “tea” are high in valuable nutrients and offer many of the same benefits of traditional compost, without a lot of the labor. 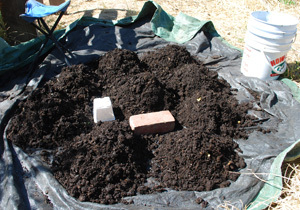 And, if you live in an apartment or don’t have a lot of yard space, you can still vermicompost! Worms are effective decomposers and are especially appropriate for softer organic waste, like food scraps. You can buy a worm bin or make it yourself (instructions below), and you already have all the food you’ll need! Two opaque (dark in color - not clear) plastic storage bins (14 gallons) and one lid. Your bin handles will need to be large enough so that when you stack the two bins inside each other, there is about 1-2 inches of space between the bottom of the inner bin and the outer bin. This space is to collect your ‘tea.’ Recommended Bin: Rubbermaid Roughneck. Electric Drill – ¼ inch drill bit. Stack of newspaper for your bedding – remove any waxy/shiny newspaper. Water to moisten your bedding. One half pound of red composting worms; Eisenia fetida. See below for local worm ranches or order online. Drill ¼ inch holes in one of your storage bins along the upper sides for aeration, spaced 2-3 inches apart (about 6-8 holes on the long sides and 2-4 holes on the short sides). Note: When you stack the bins inside each other, your holes should not be covered by the outer bin. In the same bin, drill ¼ inch holes in the bottom. These holes are for draining your ‘tea’ into the bottom collection bin. The more holes the better – about 50! Note: Make sure to drill holes in the corners (of the bottom) or your tea will collect in the ridges and will not drain out into your bottom collection bin. Now that your holes are drilled, take your sand paper, if needed, and remove any plastic ‘notches’ that didn’t fall off from drilling. Stack your bins inside each other – the bin with no holes should be your outer collection bin. Time to make your bedding! Shred your office paper or newspaper and fill your worm bin about half full – make sure you remove any waxy or shiny paper. To moisten your bedding, drizzle water slowly over your bin while mixing your bedding. You want your bedding damp, but also ‘airy’ and not extremely wet for your worms. Note: Your food scraps and the mucus on the worms will also add some moisture. Once your bedding is ready it’s time to add your worms! Place your worms in the middle of your bedding, and then cover with bedding. Information about feeding your worms: What to Feed Worms in a Worm Bin. 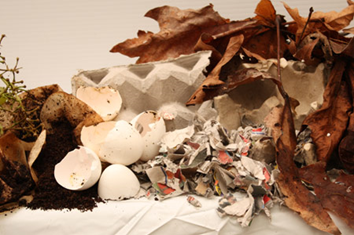 The fun part about composting is that you can try to compost just about anything! You will quickly learn what your worms like to eat and what they don’t like to eat. Yes, they have likes and dislikes. Worms don’t like a lot of movement; indeed they are sluggardly. It’s best to collect your scraps in a plastic container and feed them once a week. This pre-decomposition time, even if only for a week, will help your worms as well. Another method is to freeze your scraps and defrost just before feeding. This opens food cell walls, which makes it easier for the worms to process. Worms are vegetarians. They especially love any type of melon or banana peel! You’ll learn that they will clean some items off, but you’ll eventually have to remove leftovers from your bin—like an avocado pit or a very, very clean corncob. Note: The smaller the food scraps that go into your bin, the quicker the worms will process them—chop up your scraps if you can. "Browns" to feed in a worm bin. "Greens" to feed in a worm bin. Worm bins must be kept in a protected area, out of direct sunlight. If kept outside, protect your bin from freezing temperatures. Excess moisture can accumulate in your bin. Add dry, shredded paper if very wet, or slightly moisten your bedding if too dry. A dark fluid, “worm tea,” can be drained from the bottom collection bin. Diluted (5:1) with water, worm tea is very useful for root growth, to add nutrients and as a foliar spray. Worm castings that look like coffee grounds will accumulate in your bin (that’s the organic waste magically turned into fertilizer). When 3-4 inches deep, it’s time to harvest! 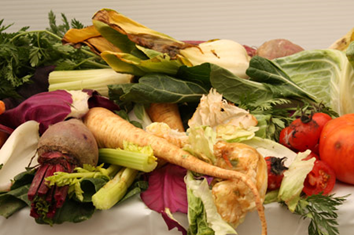 Remove all uneaten food scraps and bedding, set aside. Empty the entire contents onto a plastic sheet in a sunlit area, forming several volcano-like hills with the castings. The worms do not like sunlight. They will migrate towards the center as you scoop castings from the top and sides. Collect your worms and put them back into your bin with new bedding and the food scraps that were set aside. Vermicomposting is a great way to introduce your children to composting!